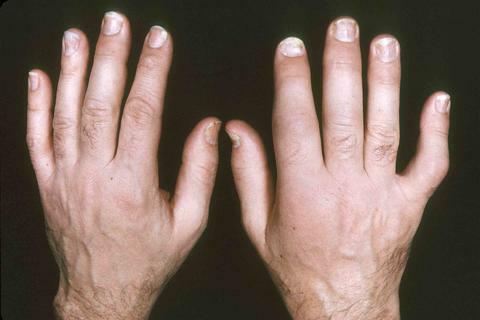 Home » Healthy Tips » What Is Psoriatic Arthritis? Experts don’t know exactly what causes psoriatic arthritis, but many believe it’s likely a combination of a person’s genetics and environment. Most people develop symptoms for the first time when they’re between 30 and 50 years old, and both men and women can have the condition. Psoriatic arthritis is chronic and progressive, but medications and lifestyle changes may help. Experts aren’t sure what causes psoriatic arthritis, although they do know that having skin psoriasis is the biggest risk factor. As many as 30% of people with psoriasis go on to develop psoriatic arthritis. You may also be more likely to get psoriatic arthritis if you have skin psoriasis that affects your nails. About 80% of people with psoriatic arthritis have some kind of nail psoriasis. There isn’t a test to diagnose psoriatic arthritis, and doctors instead look at medical history as well as a physical exam. The first question your doctor will probably ask you is whether or not you have skin psoriasis. Your doctor will want to know about your symptoms and which joints are painful or swollen.